CarGurus has 4,787 nationwide F-PACE listings starting at $29,401. An SUV from Jaguar? Believe it. The all-new F-Pace is gunning for Porsche. In most every situation, the first time isn’t the best time. 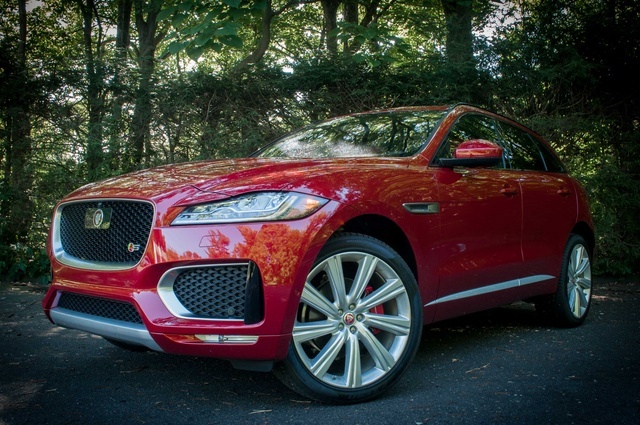 But Jaguar’s first SUV is so good—in style, performance, and value—that we’re struck at what could possibly be next. Few American buyers choose any Jaguar. The F-Pace should have their eyes and wallets on full lock. This is an easy one. What other sport-ute looks like the new F-Pace? The luxury midsize crossover/SUV segment is an oversaturated place where almost nothing stands out. There are exceptions. The Range Rover Sport is always recognizable as a big, precious box. The new Audi Q7 is exceptionally clean cut. The Volvo XC90 is downright gorgeous. But many other expensive SUVs don’t look that great, the Porsche Cayenne included. The F-Pace? Damn. Jaguar’s whole purpose was to make it look like a cross between an XF sedan and an F-Type coupe, lifted with a hatch. That they’ve done it to no ill effect is just stunning. The rear is even more impressive than the front—a place on which many car designers seem to snooze—with thin, scooping taillights, sinuously curved glass, and a shoulder line that rises up above the fenders as it blends with the tailgate’s lower portion. The 22-inch wheels and matte silver/gloss black accents adorning our loaded S model ($74,385) are the sprinkles to a spectacular design, but they’re not necessary. We drove a Premium model on 19s costing $25,000 less and felt no less special standing next to it. This is what happens when a man who penned Jaguar and Aston Martin coupes is responsible for an SUV. Chief designer Ian Callum may deserve knighthood. The excitement continues inside, especially with our car’s red and black leather seats and door panels, red stitching all over the dash, and aluminum trim by the door handles with a black criss-cross pattern etched across the top. 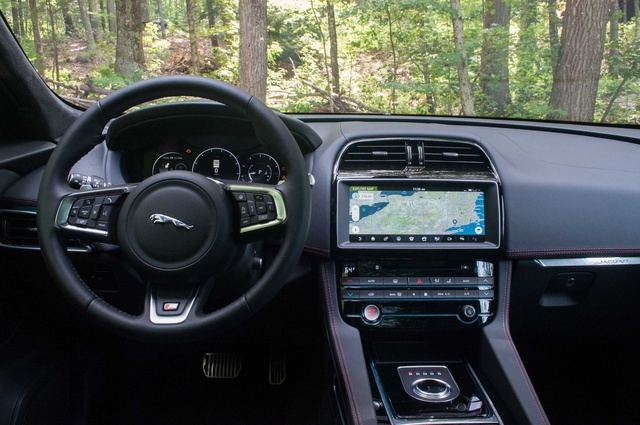 In the entry-level trims, there’s some defiantly hard plastic connecting the center stack and the central armrest, and on higher trims the dash upholstery feels rather rough compared to the soft leather used in the XJ sedan. But even when the seats aren’t leather—Jaguar calls this leatherette “Luxtec,” which is the only choice on base and Premium trims—they look and feel like the genuine article. Save for the abundance of choices within the infotainment screen, the overall ambience is simple and full of little treats, like the touch-sensitive map lights, rising rotary shifter, and pulsating Start-Stop button. You’re aware this isn’t a Mercedes or an Infiniti but something rarer. Besides nailing style, a Jaguar is supposed to perform like a sports car. This one does. One of two supercharged 3.0-liter V6 engines comes aboard, as they do across Jaguar’s lineup of sedans, coupes, and convertibles. 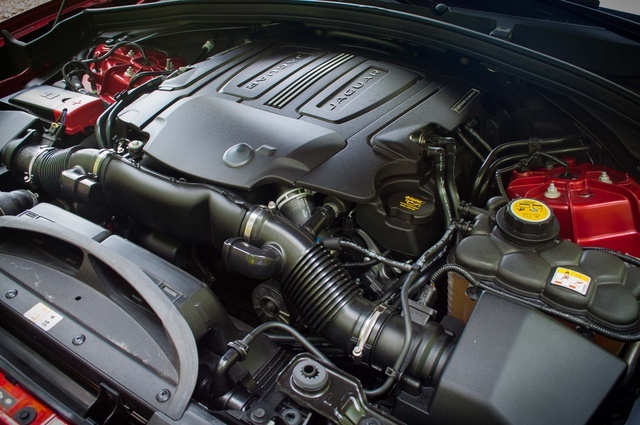 These engines are physically identical, with a software remap that boosts the S trim’s output from 340 horsepower to 380 and 332 pound-feet of torque to 339. Their power output is also identical until nearing redline, and without instrumented testing, there’s really no tangible difference between the two. Later, a 2.0-liter turbodiesel inline four will become the base engine, with 180 horsepower and 318 pound-feet of torque. But forget about the diesel. The gasoline V6 makes such pleasing music—with a curdling, baritone exhaust that’s much louder than two XF models I recently tested—that you forget you’re riding several inches higher. Acceleration in either F-Pace is potent, the shifts from the 8-speed automatic cracking off quick downshifts when tapping the steering-wheel paddles. It’s not as aggressive as the F-Type, as it shouldn’t be in a family SUV, but enough of that car’s aggressiveness carries through at max attack. That means clicking the transmission dial to “S” and engaging “Dynamic Mode,” which sharpens the throttle, transmission, steering, and suspension. Luckily, the driver can customize this mode to affect only acceleration, for example, while leaving a slightly softer ride. Emphasis on “slightly.” The F-Pace pays a price for its engaging handling and flat cornering with a stiff ride that doesn't always take kindly to pavement imperfections. The 22-inch wheels (a $4,000 upgrade) and low-profile Pirelli P Zero tires take most of the blame. They're not punishing, but they do transmit all sorts of bumps into the cabin. The 19-inch wheels—polished black over sparkling green paint, a very charming British combo on our car—were far more compliant despite lower grip levels versus the ones on the S. But if you can tolerate the occasional harsh impact, you’ll be rewarded with accurate steering feel, powerful brakes, and a genuine sports-car suspension that puts poise and confidence first. Consider the F-Pace this segment’s new benchmark. As you would expect, the F-Pace seats four in total comfort. Our car let every passenger (save for anyone in the middle) control their own cabin temperature, along with multiple levels of seat heating and cooling. In the front, the driver and passenger can even choose whether to heat or cool the bench or the backrest. The rear seats have optional power reclining, though the bench doesn’t lean that far, the switch is jammed into a tight space between the door panel and the seat cushion, and it takes too long. Speaking of switches, the window switches are mounted up high on the sills – like those in a Land Rover – not by the armrests where you’d naturally reach in a Jaguar. There’s enough room for heads and legs of all sizes, yet there’s not the sort of spaciousness you’ll find in more traditional SUVs. A panoramic moonroof is standard, which cuts down on headroom but floods the interior with natural light. 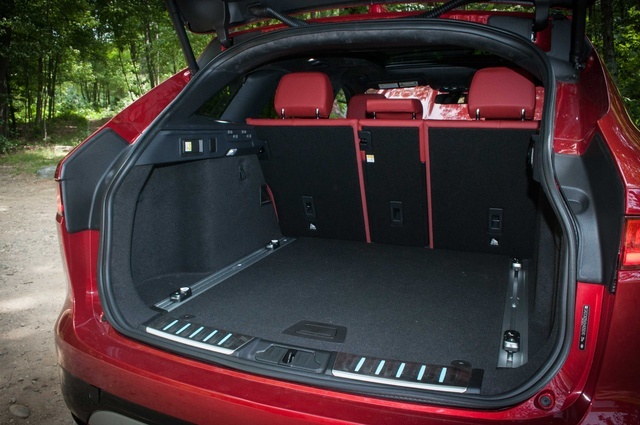 The door cutouts along the roof edge are tight—one of our passengers kept bumping her head—yet the 33.5 cubic feet in the cargo bay is decent considering the car's dramatic rear slope. Every square inch is optimized. Optional sliding cargo floor rails let you move and lock four different metal tie-downs in conjunction with plastic hooks on the sides. A full-size spare tire fits underneath (this is very welcome these days, when automakers are deleting them) and on the S, there’s a pretty aluminum scuff plate with aqua LED accent lighting. The optional LED headlights are appropriately bright and crisp. You should order them, as the standard projector-beam halogens left too many dark spots. Up front, two side pockets in the center stack are a great, easy place to store keys, toll passes, and other stuff you want to grab while driving. The chunky three-spoke steering wheel isn’t too button-crazy but has just enough so you can control the audio system, cruise control, the instrument panel, and steering-wheel heating. I’d prefer audio seek controls on the center stack, although the infotainment system is simple enough to use without them. I would never have written that last sentence in 2015, but this is 2016, and Jaguar has finally developed a worthy infotainment platform. After nearly a decade, they’ve done it. Hard buttons flank the central screen on models with the standard InControl Touch system, and these are much easier to use while driving than a touchscreen. This is a well-designed interface that’s quick to respond. The 10.2-inch widescreen InControl Touch Pro is even better, with pinch-to-zoom maps with traffic overlays and satellite topography, and all sorts of swiping and tap gestures that let the driver, with a split screen, monitor several functions at once. A 3G connection provides onboard WiFi along with live traffic, apps for news and weather, and a web browser. It never worked during my time with either car (it likely wasn't activated), and occasionally the system wouldn’t recognize a CD or let me access the 360-degree camera’s multiple views. There are bugs. Like many new cars run by computers, it's best to wait until Jaguar releases enough software updates to smooth out the kinks. The standard instrument cluster, with its 5-inch central display between two handsome analog dials, works just fine. 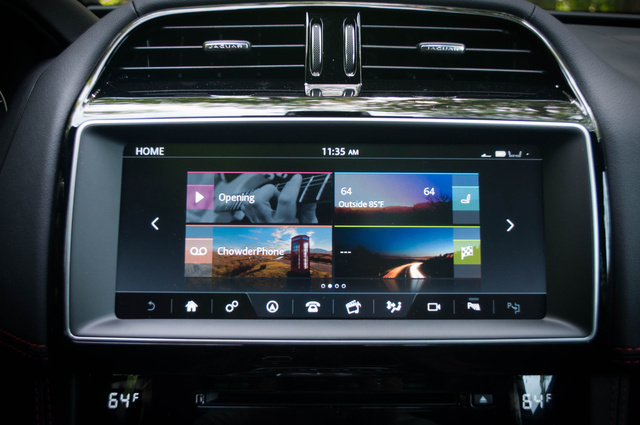 But InControl Touch Pro ($3,200, part of the Technology Package) uses an entirely digital 12.3-inch widescreen that’s leaps beyond Jaguar’s first-gen digital displays. Here you can change the appearance of the gauges and even show the map full screen (though unlike the digital dash in Audi models, you can’t zoom out). Cycling through various options is a breeze, though it would be nice to be able to show the map in a smaller view and control more of the stereo functions. An 11-speaker, 380-watt Meridian stereo is standard and sounded decent on the Premium model, but the 17-speaker, 825-watt version with multiple surround-sound processing options (Meridian, DTS Neo:6, Dolby ProLogic IIx) is worth the upgrade and part of InControl Touch Pro. It’s good but not up to the studio-quality sound of the Meridian systems in Range Rovers (of course, those vehicles cost tens of thousands more). Our car also sported a multicolor head-up display ($990) that shows speed, speed limits, cruise control, and turn-by-turn directions on the windshield. It’s helpful but wasn’t as detailed as those in BMW models, which even show radio presets. The $400 “activity key” is a gimmick. It lets you wear a FitBit-style waterproof bracelet to lock and unlock the F-Pace with the actual key inside, so that you can run or surf without worrying about losing the fob. You’re supposed to tap the “J” on the tailgate logo, although it sometimes didn’t respond. Or maybe I wasn’t being active enough. Needless to say, you don’t need it. But as far as modern electronics go, the F-Pace has ‘em all. A suite of driver assists are available in varying trim levels and option packages, though lower trims offer only a few of these features. They include forward-collision alert, auto braking, lane-departure warning, lane-keep assist, an attention monitor that tries to detect driver fatigue, and adaptive cruise control with stop-and-go. The blind-spot alert will flash rapidly if it senses a rapidly moving car approaching on either side, a unique feature. Knee airbags for the front passengers are not offered. A backup camera is standard on all but the base trim. The 360-degree cameras can be individually selected, a helpful feature to avoid curbing those huge rims. Neither the National Highway Traffic Safety Administration nor the Insurance Institute for Highway Safety has crash-tested the F-Pace. Jaguar’s new Adaptive Surface Response can detect tire slippage on various surfaces (ice, snow, wet grass) to aid traction. It’s not crazy to call this Jaguar a good value. The F-Pace, like all 2017 Jaguar models, comes with a 5-year/60,000-mile warranty with all scheduled maintenance and roadside assistance included for that duration. Five trim levels (Base, Premium, Prestige, R-Sport, S) range from $43,385 to $57,695 at their base prices. The upcoming diesel will start at $41,985 and is similarly cheaper across the other trim levels (the S is gas-only). Our two F-Pace models had wildly varying prices. The Premium stickered at $49,845, despite not having leather, heated seats, or a power steering-column adjustment. But it’s a tremendous value in this segment, even more so when you consider that smaller, less powerful Audi, BMW, and even Lincoln models easily cost more. 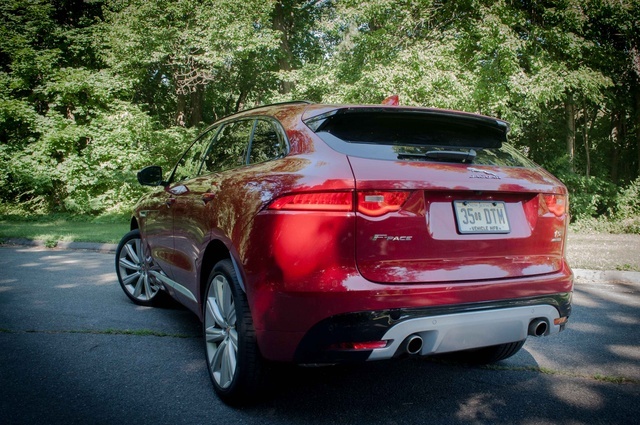 Our fire-engine red F-Pace S had nearly every option for $74,385. Still, try getting into a similarly equipped Porsche Cayenne or Macan for less than that. If you haven't considered Jaguar, now's the time. The F-Pace is an impressive vehicle that’s worth a serious look. What's your take on the 2017 Jaguar F-PACE? Have you driven a 2017 Jaguar F-PACE? Is The Jaguar F-Pace Expensive To Maintain? Why are my replies not read by the buyers? Is it something that's been blocked by CarGuru which doesn't notify the buyer on my reply? Would you guys purchase a used jaguar f pace or go for a new one?